In freedom we built the walls around us that have trapped us into a prison of our own desires. Christ busts through the door and says, "I'm getting you out of here." 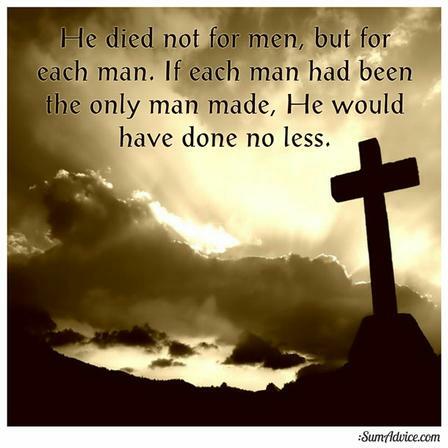 That was what His resurrection was all about it. Was about freeing us from the captivity of death, the captivity of sin. And that's what we're doing here. Today is the last day of this program. So after all these 60 days, go be free. Be free to follow Christ in ways you never thought existed. Let your heart not be troubled but let the burden be taken away. You are not a slave or a servant, but a child of God who will be given the Kingdom as an heir. Keep your accountability partner. Finish the fortify program. Keep making steps forward. You're not "cured" of your temptations but you've just spent 60 days figuring out how to manage them and grow closer to Christ. Remember the things you did here to keep you free. Read scripture, journal, take time outs from whatever you're doing to be still and pray. There's a reason why this program ends before the fortify progam is over, because you have to keep going, not entirely on your own, but in ways that continue this program in the ways you've been strengthened. This program may be done, but the work you must continue to do is not exhausted. Remember the two wolves and both still live with in you, the one that wins, is the wolf you feed. B. In the Fortify Program, Update the battle tracker. Go to week eight and check out "Are You Stressed?" and "Relax"
D. Journal the following: 1. How do I keep this going, without this program? 2. What are some things I learned along the way? 3. How can I continue to apply them. Today's Tips: When the urges come get up. Stop. Breathe. Pray. Write wolfyoufeed@gmail.com an email letting us know what we can do better or how this program impacted you. It's helpful for us to get feedback and for you to stop what you're thinking and think about others. God give you strength always.